I can hardly believe that 2018 represented ten years since my first professional novel was published. A LOT of words have been written since! I still look back very fondly on The Affinity Bridge and the time of its writing, though, partly because it was the first time I’d really had *fun* creating a new world and setting, but mostly because it was the first time I really got to know Sir Maurice Newbury and Miss Veronica Hobbes. 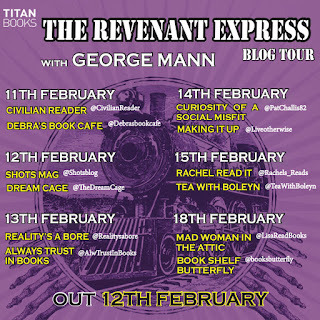 Now, on the eve of publication of The Revenant Express, the fifth book in the series (and the twelfth book in the overall alternate history sequence I’ve come to refer to as the ‘Albion Mythos’), it’s odd to look back to that period, when all of this was new. The Affinity Bridgewas written quickly, in the heat of excitement and creation, and at the time I had no idea that what I was writing would come to define much of my writing life for the next decade. I suppose I always knew there would be more stories to come – my initial notes for the series listed dozens of story ideas, some of which I still intend to come back to, one day – but at the time I was very focused on just writing a rip-roaring adventure story, something written for me, that drew inspiration from all the things I love. I was lucky that, when it came to finding a publisher for the book, both my UK and US publishers were keen to commit to a sequel, and so, soon after finishing The Affinity Bridge, I plunged straight into the follow up, The Osiris Ritual. I think it was while working on this one that I started to see the true importance of Veronica’s story to the whole saga, and much of what I’ve written about the pair since has been with this in mind. 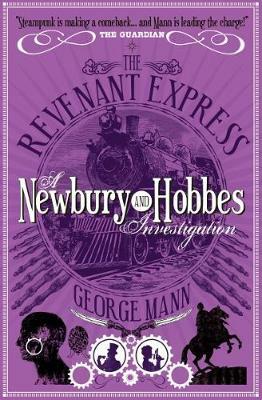 While the books are clearly anchored by Newbury and his involvement in each case, and despite the ups and downs caused by his opium addiction, he is in fact a constant throughout the stories, and it’s Veronica’s take, closely linked to that of her sister, that forms the beating heart of the series. That’s why the third book, The Immorality Engine, focuses on that sibling relationship, and how it might come to the attention of Queen Victoria and others. The Executioner’s Heart, too, places Veronica centre stage and in dire peril, and now, at last, The Revenant Expressis about to give answer to the cliffhanger at the end of that fourth novel, and show what becomes of both Newbury and Veronica in the aftermath of the terrible violence we saw inflicted in the final pages of the previous book. It’s been a few years between books, necessary, really, so that I could return to the series with renewed enthusiasm and excitement. Its worked, too, and there’s lots of new Newbury & Hobbes material on the way. The first comic book mini-series has just concluded, and is being collected as a graphic novel in April. A couple of long stories have appeared in recent anthologies, and there’s more of those to come. Brad Hoyt, a marvellous composer, has been releasing his soundtrack albums for the first three novels, the second of which has just been released. And there’s a brand new, narrative N&H board game launching in Kickstarter in the Summer, on which I’ve been working closely with the excellent folk at Needy Cat Games. To top it all off, I’m also hard at work on The Albion Initiative, the next book in the series. So, after ten years, Newbury and Veronica are still going from strength-to-strength, and the next couple of years look set to be their busiest to date. I’d never have imagined all of this when I first sat down at my computer in 2007 and started tapping out the opening scenes of The Affinity Bridge. If someone had told me then that ten years later I’d be working on the sixth novel in the series, that I’d be looking at sculpts and concept art for a board game, that there’d be a comic book out there featuring new adventures – and that I’d be thirteen books in to the strange, alternate history I was barely starting to explore back then, I would never have believed it. I can barely believe it now! 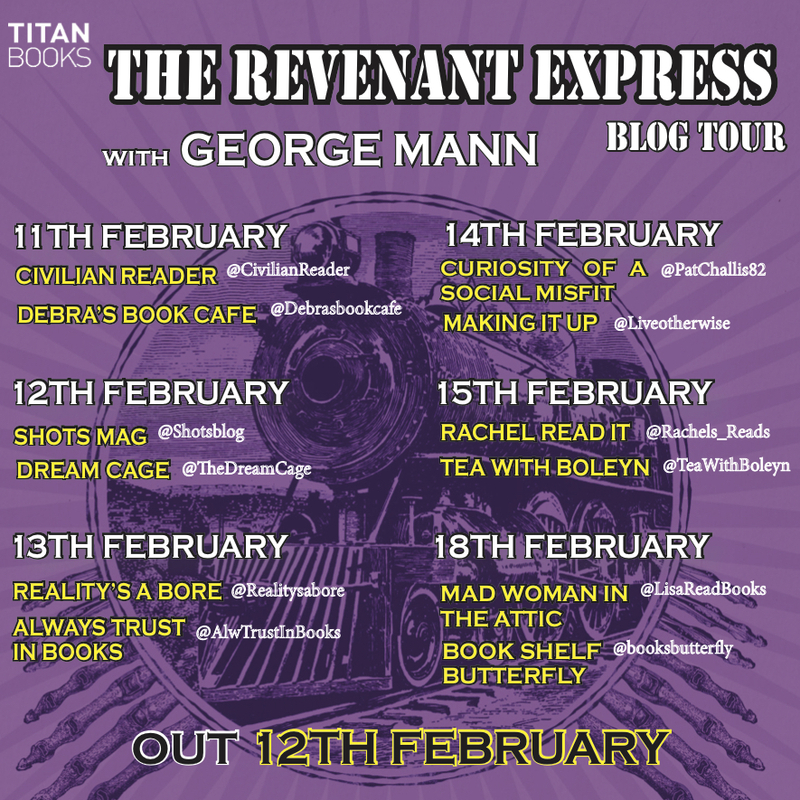 The Revenant Express: Newbury & Hobbes investigation by George Mann. (Published by Titan Books) Out Now.